5 easy steps to the perfect DIY gingerbread house! It might just be the sweetest holiday tradition. Four gingerbread walls, frosted doors and windows, a gumdrop roof — the gingerbread house is confectionary construction at its best. But for anyone who has ever tried to tackle this level of DIY, you know how much of a sticky, unstable mess it can be — especially when you get the kids involved! Sure, you could pick up one of those kits at the grocery store and save a bit of time, but they’re awfully limiting. Most are simple cottage-style homes with just enough frosting to draw a couple of windows and a front door. If you’re lucky, you might have enough white stuff to sprinkle the rooftop with “snow.” When you go with a kit, you get what you get! Where’s the imagination in that? 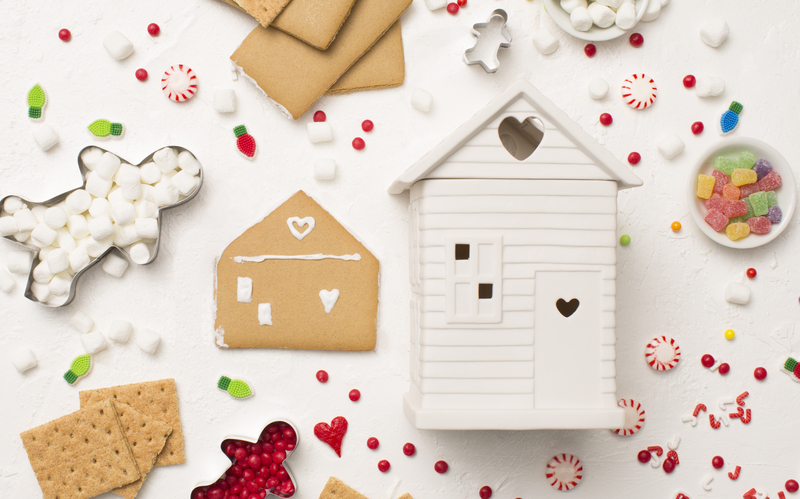 Embrace the magic of the Christmas season and some good-old childhood wonder, and build your holiday house from scratch this year — because your gingerbread family deserves the best! Get creative: Sketch out your design, or search for ideas online. Get cookin’: Bake the walls, roof and a whole gingerbread family with a recipe like this one. (Might have to double it if you’re going colonial! )Time-saving tip: If the whole baking process seems daunting, use graham crackers instead. You can still get a custom look, but in a lot less time. Make it frosty: Mix up a double batch of icing to have plenty to suit your Christmas fancy, with enough left over to give everyone a chance to lick the spoon. Be sure to divvy some of the white stuff into a few small bowls and add food coloring to kick your design up a notch! Assemble: This is where the whole thing comes together. With a pastry bag (or any plastic bag with the corner snipped off), pipe the icing like glue around the edges of your walls and roof, and assemble. Be sure to let each section dry for a few minutes before trying to move on!Time-saving tip: Not planning to eat your house? Get out your glue gun to make it even more structurally sound! You can cover the evidence with icing (and we promise not to tell). Decorate: Now for the big pay-off. Once your house is assembled, use the rest of your icing to dress it up as you please, and affix as many sweet treats as your structure can stand. We like rainbow sprinkles and chocolate chips (you might already have some stashed in your pantry). Add gumdrops, licorice or miniature candy canes for holiday flair. Now stand back and admire your very own DIY gingerbread house! Snap a photo of your gingerbread house and post it to Instagram using #FrostForACause by Dec. 8. By sharing, you’ll help bring awareness to our charitable cause partner, Habitat for Humanity®. They’re building safe, affordable homes for families who need them — and we’re here to help! Thanks for joining us in helping Habitat for Humanity make home possible for more families. To learn more, visit scentsy.com/BuiltWithLove. *Due to legal regulations, Consultants and customers in Quebec, Mexico, Puerto Rico and Guam are not eligible to enter.